Premier League stats: When will Liverpool stop scoring? Mohamed Salah, Roberto Firmino and Sadio Mane have scored 82 Liverpool goals this seasonMohamed Salah broke yet another record on Saturday, when he scored his 30th league goal to help Liverpool to a comfortable 3-0 victory over Bournemouth.He is just the eighth player to reach that landmark in a Premier League season and the first African to do so - eclipsing then Chelsea striker Didier Drogba's record of 29 in 2009-10.More significantly, his tally in all competitions this season is now 40 - a figure only two other players in Liverpool's history have achieved. Roger Hunt (1961-62) was the first - and Ian Rush (1983-84 and 1986-87) the second. Liverpool's attacking trio - Salah, Roberto Firmino and Sadio Mane - have combined to score a total of 82 goals[/i] this season.That has helped the club score 121 goals in all competitions - a figure manager Jurgen Klopp described as "crazy". "What a number. Wow! 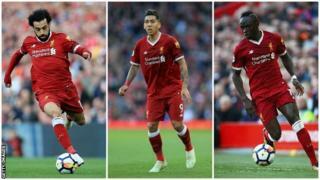 That's really good but we have to carry on," said the German.Since Klopp's arrival in October 2015, Liverpool have scored 300 goals in 148 games. bbc.comThat goalscoring prowess has helped Liverpool achieve a win percentage second only to Rafa Benitez's reign in the past 15 years. And Salah is not the only one breaking individual records.Mane is now the highest-scoring Senegalese player in Premier League history - his 44 goals eclipsing Demba Ba's total of 43. One clear improvement has been their success on the road. Burnley have won seven games away from home this season - four more than their previous record in the Premier League. Arsenal's 2-1 defeat at Newcastle on Sunday completed their worst run away from home in the top division since December 1984.It was their fifth successive away defeat in the league and their 11th overall in the division this season. That equalled their worst tally of league defeats in a season under Arsene Wenger.The cracks have shown in defence - they have conceded 45 goals this season - one more than in the whole of last season, with five games left to play.The Gunners, who are sixth, are 13 points adrift of the top four, meaning they are almost certain to miss out on a place in the Champions League for a second successive season - unless they win the Europa League.Wenger's side are 33 points behind champions Manchester City on 54 - their lowest tally at this stage of the season since 1995. Manchester City are Premier League champions for the third time in seven seasonsManchester City were crowned champions on Sunday following Manchester United's defeat by West Bromwich Albion at Old Trafford.They finished the job with five games left to play - a joint-record for securing the English top-flight title with the most games remaining. bbc.comBut there's still plenty to play for.City are now chasing the record points tally of 95, which was set by Chelsea in 2004-05. They are already level with Arsenal's 2001-02 title-winning side, who finished on 87 points. The Blues could also beat their own tally of 89, set in 2011-12.
bbc.comWith 15 points still up for grabs, City could finish the season on 102 points. No team has won the English top flight with 100 points or more.Pep Guardiola could also beat his previous best points tally in a single league season as a manager - 99, with Barcelona in 2009-10. » Liverpool v Man City: Who made your combined XI?